The LPM is for businesses who delight customers. The three layers; coupon, loyalty and referral attract, retain & grow the business. 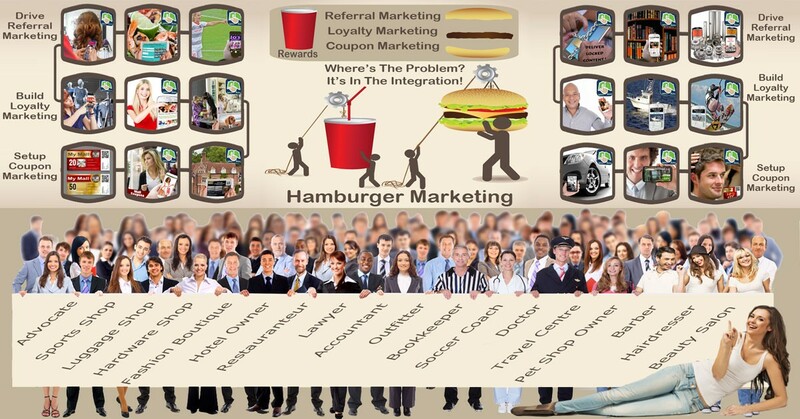 We call it Hamburger Marketing because the layers combine to make each as individual as you want them to be. Our Grandparents and their's used Word of Mouth Marketing (WoM) to grow their businesses. Absolutely, it has worked for generations. Read on and discover how we have automated WoM to be all that it can be in the online world of the internet. WoM used to be simple, it still is, you know that you have to attract customers, then you have to deliver and delight so as to stand a chance of getting them to refer you to a friend or business colleague. If half do, twice a year, your turnover will double. Drive the Referral Layer: Reviews grow reputations. Sharing is online WoM. Structured rewards grow reputations and referrals. Build the Loyalty Layer: Start with private customer accounts, then engage and find out exactly what the value is that you deliver. Setup the Coupon Layer: Attract new customers and segment them into lookalike groups to service their specific needs or desires. The LPM has no beginning and no end. It is about creating a community that services the needs of the others. We offer a SaaS (Software as a Service ) package that automates the marketing on a site, apps, blog and social media. Try it free and we will show you what it can do for you. Our Wednesday Webinars take the form of a Q&A disussion. They are restricted to small groups so as to allow us to get personal about your business. By arrangement, we will also set up one-on-one video conferences between us and your team in a Webo Online Meeting Room. Contact us to set up a one on one discussion. Set out below are a range of videos that address frequently asked questions as well as recorded webinar introductions. Our Apps make it easy !